Towards the end of Dave Haslam‘s odyssey into British nightlife, he employs a metaphor that is unusual, even startling in its brilliance: ‘the enduring idea of a secret garden, the midnight garden – the clock strikes thirteen and through a door a different world appears.’ The author of Manchester, England, an essential history of that city, and a former Hacienda DJ, Haslam knows that the night was never centred on Soho or South Kensington or any regional superclub. ‘The best club in the world is the one that changed your life,’ Haslam writes. ‘[T]o be honest, most of the time I’m prejudiced in favour of the dives.’ He’s travelled the length of the UK, and through social history (beginning with the music hall craze of the nineteenth century) to unearth those lost and timeless moments. 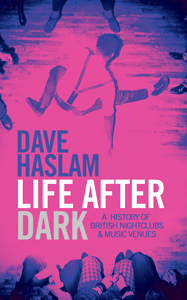 For Life After Dark Haslam interviewed maybe hundreds of ex promoters, DJs and businessmen, old men and women with lines on their face and funny accents and stories to tell about locations that are now apartment blocks or Tesco Extras or Ibis hotels but where, once, something special occurred. As a career DJ himself, who’s always been surrounded by musicians, Haslam has a lot of tales to tell, and the book quickly suffers the weakness of comprehensive history, lapsing into a blur of names, places and dates. He also has a weakness for celebrity: Life After Dark has a preponderance of big names from various eras – ‘the likes of’ – who dominate the narrative. It would have been better to frame the book with memories from punters who were there at the time. Haslam also can’t always distinguish between anecdotes that entertain in the retelling and those ‘you had to be there’ moments. The story of the music hall performer who killed a heckler that interrupted his act (the court was sympathetic and sentenced him to just fourteen days) deserved a mass market audience: the variations of ‘and then Morrissey fell off the stage’ probably didn’t. Haslam takes his time getting to the most compelling part of his story: the rave scene. The British establishment had no idea how to handle rave. A disparate network of electro freaks, artists, mystics, hedonists and business people were holding massive parties in fields and abandoned warehouses. The organisers of the gigantic free parties were liberals, positive and compassionate, but they were also entrepreneurs who had a healthy scepticism towards authority and the big state. For the audience, acid house was a liberation from social rules. Men could go to a rave club without worrying about getting into a fight: women could go without the fear of being groped, followed or even assaulted by drunken morons. MDMA suspended the weekend’s conventions. Rave was a mob with a soul. Two hundred years after we left the fields, there’s a lot more free entertainment, available at the peck of a keyboard, but people still go to pubs and clubs. For all that we’re supposed to be digital addicts, Britons like to physically leave the house and interact with other human beings. In his final chapter, Haslam argues that the trend is instead towards more ‘primary experience’ – more music festivals, pub gigs and literary festivals where even solitary bookworms can meet their favourite authors face to face. Manchester, England features a quote from Arthur Shadwell: ‘What most human beings like is companionship, life, things going on, the presence and stir of other human beings.’ He was writing about Manchester in 1906 but could have been about anywhere and anywhen. The cliché is true. We are social animals. Considering the weight of tradition behind UK nightlife (and its contribution to the economy: the Institute of Economic Affairs claims that alcohol use alone nets the Treasury a surplus of £6.5 billion a year) it’s a sad surprise that the authorities think so little of it. Of the temperance movements in the nineteenth century, Haslam writes: ‘it was really only working-class intemperance that was considered problematic and targeted by a number of mainly failed initiatives.’ Plus ca change. Today, the community is important – except when it comes to your local, which is being hammered by business rates and the smoking ban. Heritage is important, except when it comes to historic dance halls which can be demolished to put up more chain shops and business hotels. We live in a time when a city centre venue, that has operated for decades, can be threatened with closure because some guy has moved into an apartment block next door and complains about the noise. But it’s not just a question of creating atmosphere and taste: there are psychological dangers as well in creating places which have too much security and as a result are too safe and too controlled. The problem is that these environments remove personal responsibility, undermining our relationship with the surrounding environment and with each other and removing the continual, almost subliminal interaction with strangers which is part of a healthy city life. The consequence is that people are far more frightened when they do have to confront the unexpected, which can never be entirely removed from daily life. Haslam ends on a positive note. The recession has left large numbers of void buildings and young people with nothing to do. It’s the paradox of creativity that in hardship something can rise. More and more of us are finding the door to that secret garden, and wandering in.